Cards: Ultimate WLAF 1992, Wild Card WLAF 1992, Topps 1988. Darryl Clack had an outstanding career for the Arizona Sun Devils. His freshman season he ran for 606 yards on 111 carries and followed it up with 932 yards and 9 touchdowns his sophomore year. Running for 1052 yards his junior year, it looked like everything was on the up and up for Darryl Clackers, but with a broken leg, he’d be sidelined for nearly his entire senior season. The Dallas Cowboys were looking for an heir apparent to aging runningback Tony Dorsett in 1986. The Cowboys used their second round pick to select the electrifying Clack (who was still rehabbing from that broken leg that he sustained during his senior season). Still things looked great for Clack, until fate intervened -and the USFL imploded. You see the Dallas Cowboys had shrewdly invested a 6th round pick in runningback virtuoso Herschel Walker, hoping that he’d become available, so instead of becoming the Cowboys back of the future, Darryl became the kick returner of today with the arrival of Walker in camp. Clack was seldom used during his rookie season. He’d lodge 19 kick returns for 421 yards including a 51 yard long. In 1987, with Dorsett and Walker firmly entrenched now as starters, Clack didn’t see anytime at runningback but in 1988 with Dorsett signing with Denver, Clack made 17 receptions for 126 yards and his first professional touchdown. Darryl also had 690 yards on kick returns for the Cowboys, marking a career high 870 yards from scrimmage. After the season with Jerry Jones in place as the new owner, longtime coach Tom Landry would be fired after a 3-13 season, and with Jimmy Johnson in as head coach, the Cowboys traded Herschel Walker to the Vikings. 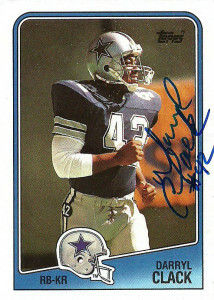 While playing only half the season for the team in 1989, Clack did not see any significant playing time, and was cut. Darryl signed with the Browns in 1990, however he did not make the squad. 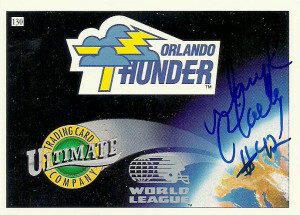 Out of football for a whole season, Darryl was given a second chance to play by the WLAF’s Orlando Thunder in 1992, who were retooling after a mediocre 5-5 season under new head coach Galen Hall. Clack put up great numbers for the Thunder and finished as the league’s 3rd leading rusher, helping the team make an appearance in World Bowl II. He’d earn All World League honors for his efforts. As the league reorganized after the season, Darryl officially hung up his cleats and retired. He’s spent time in the banking industry for a while there at Compass in Arizona. I had tried in vain to get him but had gotten no response. Recently the Texas Autograph Club hosted a signing through the site and I jumped at the chance to get him on 3 cards. 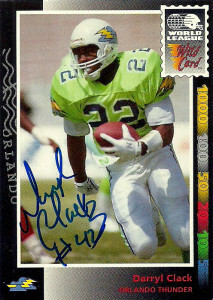 I had hoped that Clack would answer my questions for me about his playing time in the WLAF, but all I got back were the autographs.